At a press conference in New York on Tuesday 26 October, at the 65th session of the United Nations General Assembly, one of the UN’s key human rights experts will call for a fundamental rethink of international drug policy. Ensure that all harm-reduction measures (as itemized by UNAIDS) and drug-dependence treatment services, particularly opioid substitution therapy, are available to people who use drugs, in particular those among incarcerated populations. Decriminalize or de-penalize possession and use of drugs. Repeal or substantially reform laws and policies inhibiting the delivery of essential health services to drug users, and review law enforcement initiatives around drug control to ensure compliance with human rights obligations. To the UN drug control agencies, Mr Grover recommends the creation of an alternative drug regulatory framework based on a model such as the Framework Convention on Tobacco Control. The report has been welcomed by the European Union in the EU statement on crime and drugs to the UN General Assembly. Tuesday, 26 October at 1:15pm at the Dag Hammarskjöld Auditorium, New York, (close to the UN library in the Secretariat Building - entrance on 42nd Street and 1st Avenue). There will be a press release issued. Mr Grover WILL NOT BE AVAILABLE for press comment prior to the press conference. The current international system of drug control has focused on creating a drug free world, almost exclusively through use of law enforcement policies and criminal sanctions. Mounting evidence, however, suggests this approach has failed, primarily because it does not acknowledge the realities of drug use and dependence. While drugs may have a pernicious effect on individual lives and society, this excessively punitive regime has not achieved its stated public health goals, and has resulted in countless human rights violations. People who use drugs may be deterred from accessing services owing to the threat of criminal punishment, or may be denied access to health care altogether. Criminalization and excessive law enforcement practices also undermine health promotion initiatives, perpetuate stigma and increase health risks to which entire populations - not only those who use drugs - may be exposed. Certain countries incarcerate people who use drugs, impose compulsory treatment upon them, or both. The current international drug control regime also unnecessarily limits access to essential medications, which violates the enjoyment of the right to health. The primary goal of the international drug control regime, as set forth in the preamble of the Single Convention on Narcotic Drugs (1961), is the “health and welfare of mankind”, but the current approach to controlling drug use and possession works against that aim. Widespread implementation of interventions that reduce harms associated with drug use — harm-reduction initiatives — and of decriminalization of certain laws governing drug control would improve the health and welfare of people who use drugs and the general population demonstrably. Moreover, the United Nations entities and Member States should adopt a right to health approach to drug control, encourage system-wide coherence and communication, incorporate the use of indicators and guidelines, and consider developing a new legal framework concerning certain illicit drugs, in order to ensure that the rights of people who use drugs are respected, protected and fulfilled. Amend laws, regulations and policies to increase access to controlled essential medicines. Integrate human rights into the response to drug control in laws, policies and programmes. Encourage greater communication and dialogue between United Nations entities with an interest in the impact of drug use and markets, and drug control policies and programmes. Consider creation of a permanent mechanism, such as an independent commission, through which international human rights actors can contribute to the creation of international drug policy, and monitor national implementation, with the need to protect the health and human rights of drug users and the communities they live in as its primary objective. Formulate guidelines that provide direction to relevant actors on taking a human rights-based approach to drug control, and devise and promulgate rights-based indicators concerning drug control and the right to health. Consider creation of an alternative drug regulatory framework in the long term, based on a model such as the Framework Convention on Tobacco Control. On the eve of the Comprehensive Spending Review it seems like an opportune moment to relaunch Transform's 2009 report: 'A Comparison of the Cost-Effectiveness of Prohibition and regulation of Drugs', now updated and beautifully redesigned (available online pdf). The publication created a decent media splash, led to a PQ and ultimately a meeting with the Prime Minister (see below for summary and details). Despite the billions spent each year on proactive and reactive drug law enforcement, the punitive prohibitionist approach has consistently delivered the opposite of its stated goals. The Government’s own data clearly demonstrates drug supply and availability increasing; use of drugs that cause the most harm increasing; health harms increasing; massive levels of crime created at all scales leading to a crisis in the criminal justice system; and illicit drug profits enriching criminals, fuelling conflict and destabilising producer and transit countries from Mexico to Afghanistan. This is an expensive policy that, in the words of the UN Office on Drugs and Crime, has also created a raft of 'negative unintended consequences’. 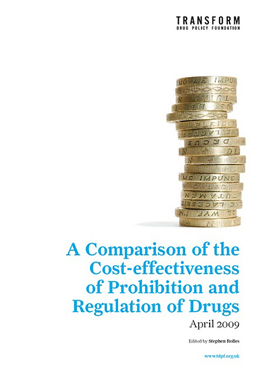 The UK Government specifically claims the benefits of any move away from prohibition towards legal regulation of drug markets would be outweighed by the costs. No such cost-benefit analysis, or even a proper Impact Assessment of existing enforcement policy and legislation has ever been carried out here or anywhere else in the world. Yet there are clear Government guidelines that an Impact Assessment should be triggered by amongst other things, a policy going out to public consultation or when ‘unintended consequences’ are identified, both of which have happened with drug policy in recent years. Alternative approaches - involving established regulatory models of controlling drug production, supply and use - have not been considered or costed. The limited cost effectiveness analysis of current policy that has been undertaken has frequently been suppressed. In terms of scrutinizing major public policy and spending initiatives, current drug policy is unique in this regard. The generalisations being used to defend continuation of an expensive and systematically failing policy of drugs prohibition, and close down a mature and rational exploration of alternative approaches, are demonstrably based on un-evidenced assumptions. This paper is an attempt to begin to redress these failings by comparing the costs and benefits of the current policy of drug prohibition, with those of a proposed model for the legal regulation of drugs in the UK. We also identify areas of further research, and steps to ensure future drugs policy is genuinely based on evidence of what works. This initial analysis demonstrates that a move to legally regulated drug supply would deliver substantial benefits to the Treasury and wider community, even in the highly unlikely event of a substantial increase in use. Transform's Steve Rolles (report editor) Drug policy "not cost-effective"
BBC Mark Easton's Blog: Could we save billions by legalising drugs? As law professors at many law schools who focus on various areas of legal scholarship, we write this open letter to encourage a wholesale rethinking of marijuana policy in this country, and to endorse the Tax and Control Cannabis 2010 initiative—Proposition 19—that will be voted on in November in California. For decades, our country has pursued a wasteful and ineffective policy of marijuana prohibition. As with alcohol prohibition, this approach has failed to control marijuana, and left its trade in the hands of an unregulated and increasingly violent black market. At the same time, marijuana prohibition has clogged California’s courts alone with tens of thousands of non-violent marijuana offenders each year. Yet marijuana remains as available as ever, with teens reporting that it is easier for them to buy than alcohol across the country. Proposition 19 would remove criminal penalties for private use and cultivation of small amounts of marijuana by adults and allow California localities to adopt—if they choose—measures to regulate commerce in marijuana. Passage of Proposition 19 would be an important next step toward adopting an approach more grounded in reason, for California and beyond. Our communities would be better served if the criminal justice resources we currently spend to investigate, arrest, and prosecute people for marijuana offenses each year were redirected toward addressing unsolved violent crimes. In short, the present policy is causing more harm than good, and is eroding respect for the law. Moreover, we are deeply troubled by the consistent and dramatic reports of disproportionate enforcement of marijuana laws against young people of color. Marijuana laws were forged in racism, and have been demonstrated to be inconsistently and unfairly applied since their inception. These are independent reasons for their repeal. Especially in the current economic climate, we must evaluate the efficacy of expensive government programs and make responsible decisions about the use of state resources. We find the present policies toward marijuana to be bankrupt, and urge their rethinking. This country has an example of a path from prohibition. Alcohol is subject to a regulatory framework that is far safer in every respect than the days of Al Capone. Just like the State of New York did when it rolled back Prohibition 10 years before the nation as a whole, California should show leadership and restore respect for the law by enacting the Tax and Control Cannabis 2010 initiative this November. Click here to sign and endorse! *All affiliations are listed for identification purposes only. 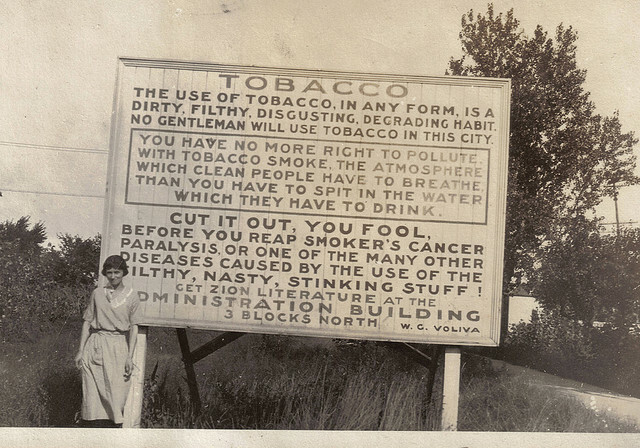 There's something charmingly blunt about this anti-smoking poster from 1915. It also contains a number of strangely prescient cues for tobacco policy (and some elements of illegal drug policy) over the following century. The summary and conclusions are copied below, the full document (in Pdf format) is available here. Transform has a number of serious concerns about the consultation process and the contents of the consultation paper itself. These concerns are explored first with reference to the consultation document where relevant, and the Governments consultation code of practice. We then highlight and discuss key areas of policy that are absent from the consultation. The consultation does not adhere to the first three criterion of the Government’s consultation code of practice regarding when to consult, duration of the consultation, or clarity and scope of impact. There is no Impact Assessment for proposed policy changes, or research data / analysis presented in support of any proposals. There are some positive things in this consultation. We are pleased to see the call for ‘a more holistic approach with drugs issues being assessed and tackled alongside other issues such as alcohol abuse, child protection, mental health, employment and housing’. Transform have long argued that levels of problematic drug use primarily reflect a complex interplay social, economic and cultural variables. In addition to those above we would certainly include social deprivation, inequality and broader measures of personal and social wellbeing. The corollary of this, of course, is that the impact of drug policy as traditionally conceived (prevention, treatment, and enforcement) should not be overestimated and may be marginal, in many cases irrelevant, relative to the underlying social determinants of drug using behaviours. This analysis – that problematic use is essentially a barometer of a social wellbeing (or lack of) - has obvious implications for longer term prevention and harm reduction strategies. It suggests that success is likely to flow more from investment in social capital and addressing multiple deprivation and inequality issues, particularly as they affect young people, rather than from pouring ever more money into more conventional interventions that are poorly supported by evidence. Whilst conventional drug policy may only be able to achieve, at best, fairly marginal impacts on prevalence of problematic use, the overarching prohibitionist legal framework can, however, have a dramatic impact on levels of harm associated with drug use. This can be both by increasing health risks associated with use, and through the wider social harms created or exacerbated by the illegal drug market. This goes to the heart of the drug policy and law reform position that Transform represents; a pragmatic position that accepts both the reality of demand for drugs as it currently exists, and that this demand will be met by illegal supply routes if no legally regulated supply option exists. Drug markets can be controlled and regulated by governments or by gangsters; there is no third option that involves a drug free society. We argue that legally regulating drug production, supply and use (as detailed in ‘After the War on Drugs; Blueprint for Regulation’) would deliver better outcomes than the anarchic criminal free for all and underground drug culture we currently have. The pragmatic mindset also requires that whilst we acknowledge most people do not use illegal drugs, we must also acknowledge that most of those who do, do so relatively responsibly. Their use is not associated with significant personal or social harms, and as such should not be deemed problematic. Of people (globally) who report using illegal drugs in the last year The UNODC only describes 5% as problematic users. It is important to be mindful of the 95% of non-problematic users who do not need treatment – let alone criminal sanction. Whilst there is a welcome and growing acknowledgement that treatment, prevention and education should be are tailored to individual and local needs - prohibition remains a blunt, inflexible and indiscriminate legislative tool, an absolutist position that criminalises all users regardless of their impact on themselves or those around them, similarly forcing all supply in the hands of criminal profiteers. The reform position has its roots in the critique of the failings of this approach – both on its own terms, and regards the secondary unintended harms of the illegal trade it fuels. As has been alluded to in this response, the prohibitionist paradigm cannot stand scrutiny, which is at least part of the reason why scrutiny has been so studiously avoided for so long. Indeed the ‘war on drugs’ has required a monumental propaganda effort to sustain it – just as many other wars have. Of the same document the Government’s own Statistics Commission similarly accused the Home Office of spinning the data to make it look more favourable and failing to ‘provide a balanced presentation of the relevant statistical and other evidence’. Meanwhile a rigorous and critical ‘value for money’ study (referred to on page 10) that informed the Home Office’s internal review was not made publicly available – only emerging this year following an absurdly protracted 3-year FOI battle with Transform. Many the problems with that ill fated consultation (regards process, content and transparency) have unfortunately now been repeated, although this time around we do not even have crudely spun evidence to criticise – there is simply none. This is why the core of our call in this response is to return to the evidence; to have, if you will forgive the oft-misused political clichés, a ‘mature and rational debate’ about ‘what works’. But this time with all options on the table. This requires open, honest and ongoing evaluation, and as a starting point; independently overseen Impact Assessments of all policies and legislation, new and old (including the MDA 1971). In terms of the general mindset, this will entail a move from misplaced moralising and outdated (but entrenched) drug war ideologies to pragmatic public health and social policy norms. If the Government follow the evidence it can only lead to better policies and the better outcomes we all seek. We are confident that if this happens it will only lead in one direction – and it will not be towards criminalisation and prohibition. Sadly this consultation falls short on almost every front – it is tokenistic, politicised, and entirely inadequate for the reasons outlined. It is more than a missed opportunity; it is entirely unacceptable as a basis for developing a new drug strategy. We therefore recommend that it be reviewed by the Cabinet Office (and will be requesting this from the Cabinet Minister) with a view to being re-launched. The new consultation process should address the identified shortcomings by adhering to the Government code of practice, including evidential support and Impact Assessments for all proposals, and covering all aspects of UK drug policy of concern to stakeholders. October 7, 2010 [Vancouver, Canada] – The International Centre for Science in Drug Policy (ICSDP) today released a new research report that demonstrates the clear failure of U.S. marijuana prohibition and supports calls for evidence-based models to legalize and regulate the use of cannabis. The British Medical Journal, one of the world’s most influential medical journals, published a supportive commentary to coincide with the report’s release today. 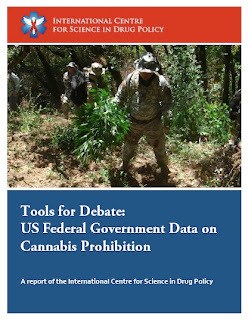 The new report, entitled "Tools for debate: U.S. federal government data on cannabis prohibition", uses 20 years of data collected by surveillance systems funded by the U.S. government to highlight the failure of cannabis prohibition in America. The report has deep relevance for California as the state prepares to vote on the Regulate, Control and Tax Cannabis proposition and, potentially, legalize cannabis. Despite dramatically increased law enforcement funding, the U.S. government’s data demonstrates that cannabis prohibition has not resulted in a decrease in cannabis availability or accessibility. According to the US Office of National Drug Control Policy, federal anti-drug expenditures in the U.S. increased 600% from $1.5 billion in 1981 to over $18 billion in 2002. However, during this period, the potency of cannabis increased by 145% and the price of cannabis decreased by a dramatic 58%. According to U.S. government funded reports, in the face of increasing enforcement expenditures over the last 30 years, cannabis has remained almost “universally available” to young Americans. Cannabis use among U.S. grade 12 students increased from 27% in 1990 to 32% in 2008 and approximately 80-90% of grade 12 students say the drug is “very easy” or “fairly easy” to obtain. In addition to describing the failure of cannabis prohibition, the report notes that legalization combined with the implementation of strict regulatory tools could be more effective at controlling cannabis use and reducing cannabis-related harms. Research demonstrates that similar regulatory tools have been successful in controlling the harms of tobacco and alcohol when strictly enforced. The report also discusses the regulatory tools available to governments, including conditional licensing systems; age restrictions; product taxation; retailer operating and location limitations; marketing prohibitions; and packaging guidelines. While the report urges an evidence-based approach to cannabis regulation and notes the comparative successes several European countries have had in decriminalizing cannabis use, it also notes the limitations of models in place in Netherlands and Portugal. People who use marijuana in these two European countries do not face prosecution, but the production and distribution of cannabis remains illegal and largely controlled by organized crime. “Legalization and strict regulation are more likely to be effective at eliminating the role of organized crime in marijuana production and distribution, because the profit motive is effectively removed,” said Dr. Wood. In his commentary published in today’s British Medical Journal (bmj.com), Dr. Robin Room notes that regulatory tools developed at the end of alcohol prohibition in the 1930s can also be used today to successfully control cannabis. Dr. Wood is one of the six international illicit drug policy experts who authored the report, which has been endorsed by over 65MDs and PhDs in 30 countries who are members of the ICSDP Scientific Network. The full report is available online at www.icsdp.org. A related ICSDP report released in April 2010 demonstrates that the illegality of cannabis clearly enriches organized crime and drives violence, as street gangs and cartels compete for drug market profits. In Mexico, an estimated 28,000 people have died since the start of the drug war in 2006. U.S. government reports have previously estimated that approximately 60% of Mexican drug cartel revenue comes from the cannabis trade. The full 26-page report, “Effect of Drug Law Enforcement on Drug-Related Violence: Evidence from a Scientific Review,” is available online here. ICSDP is an international network of scientists, academics, and health practitioners who have come together in an effort to ensure illicit drug policies are informed with the best available scientific evidence. The ICSDP aims to be a primary source for rigorous scientific evidence on illicit drug policy in order to benefit policymakers, law enforcement, and affected communities. To this end, the ICSDP conducts original scientific research in the form of systematic reviews, evidence-based drug policy guidelines, and research collaborations with leading scientists and institutions across diverse continents and disciplines. 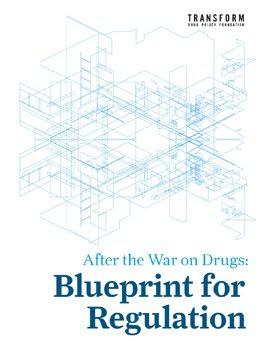 Note: Transform's 'After the War on Drugs, Blueprint for Regulation' is cited in the report and Transform provided peer feedback on a draft of the text. The Federal Controlled Substances Act of 1970 defines U.S. drug control. For forty years it has affected crime, public health, and the justice system, with little success: the societal harm relating to drugs continues to escalate. What can health and law enforcement officials do differently to control the supply of and demand for psychoactive substances? What economic, regulatory, and social tools to control the drug markets are we not using? Which currently regulated markets for potentially harmful substances or products might be adapted to control the sale and use of illicit drugs? Which controls best protect young people? Roger Goodman, J.D., Vice Chair, House Judiciary Committee, Washington State Legislature, Kirkland, WA. Topic: Current legislative struggles to reform drug regulation at the state level: legal, practical and ideological obstacles. Mark Haden, M.S.W., Addiction Clinical Supervisor, Vancouver Coastal Health Authority, Vancouver, B.C., Canada. Topic: Options for regulation of drugs based on public health and human rights. Nathan Riley, Legislative Assistant, N.Y. State Senator Joseph Galiber (1990-1993), New York, NY. Topic: An early attempt to create a regulated market for drugs in New York State and public health crises as the primary impetus for drug law reform to date. Stephen Rolles, Senior Policy Analyst, Transform Drug Policy Foundation, author of “After the War on Drugs: Blueprint for Regulation,” Bristol, England. Topic: Existing models around the world for regulating products such as caffeine, tobacco, alcohol, pharmaceuticals, as well as prohibited psychoactive substances. Marc Sorini, Esq., Head of the Alcohol Regulatory and Distribution Group, McDermott Will & Emery, Washington, D.C.
Eric E. Sterling, President, Criminal Justice Policy Foundation, Assistant Counsel, U.S. House Judiciary Committee (1979-1989), Silver Spring, MD. Topic: History of federal drug laws from 1914, focusing on the Controlled Substances Act and Reagan-era criminal statutes.